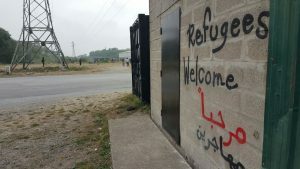 There are currently around 700 refugees living in and around Calais. They are sleeping rough in the worst conditions and are not allowed to even have tents for shelter from the elements. Their sleeping bags and possessions are regularly confiscated by the police as, since the closure of the ‘Jungle’ camp in October 2016, the authorities are determined to prevent another permanent camp from reforming. Sleeping rough, they have no access to sanitation and rarely get to change their clothes, so skin disease is rife. They hardly ever get a good night’s sleep and general health is poor. 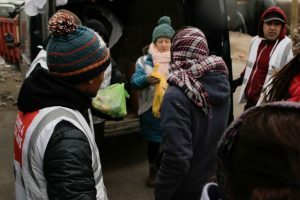 Our core work is distributing aid at a number of sites weekly. We aim to deliver the most needed items such as clothes, shoes, sleeping bags and toiletries in an efficient, friendly and dignified manner. At present, the refugees we work with originate mainly from Northern Africa, Afghanistan, and the Middle East. 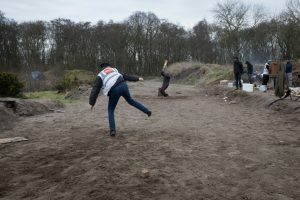 Having fled war, dictatorships, persecution and political oppression they require basic humanitarian aid, but also hugely appreciate the social interaction and moral support of our volunteers whether over a cup of tea from our van, or in a game of football or cricket.